How does a small business stand out from the crowd? When you advertise on a social media platform, you’re relying on others to do something for you. If you don’t want your post/image/ad to be static, you need people to share it. The problem is – depending on how many people your customers follow, their news feeds are going to be moving pretty fast. So you have to stand out to grab their attention. If you don’t, your post isn’t going anywhere. If you have a business that provides a service (think physio, hair salon, dog groomer, plumber – you get the idea) then the biggest thing you can use to attract attention is your availability. READ: Which social media platform is best for your business? If you’re recommended to someone on any platform, being able to say that you have free slots makes you different to every other recommendation. Example: Someone on Facebook asks for recommendations. Their friends recommend their favourite businesses, and one of your existing customers recommend you. Sounds good, but who does the potential customer call first? Perhaps they’ll look at which business has been recommended the most and start there… then call the rest to see who can fit them in. But think about if your business is recommended along with when you have a slot free. Now the game has changed. In a list of 20 other businesses, you have a major advantage. And that’s where me:now will help you. 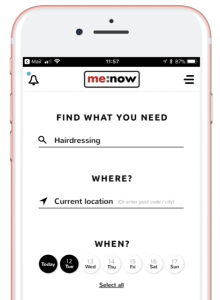 Our app adds when you’re available to your recommendation so that you can stand out. It’s also a great way to keep your existing customers informed about when you have a free slot. Customers can follow you in the app and choose to be notified when you have a free slot. So, if you have a small business, what are you waiting for? 3. Tell your customers to follow you and that they’ll be the first to know when you’re free. Why wouldn’t you want to stand out from the crowd? ← Are you gambling with your business?